Chinese design firm Studio Liu Lubin is exploring the concept of the "micro house," a structure that offers the minimum necessary indoor living space, with rooms that can be stacked on top of and alongside one another in an architectural game of Tetris. 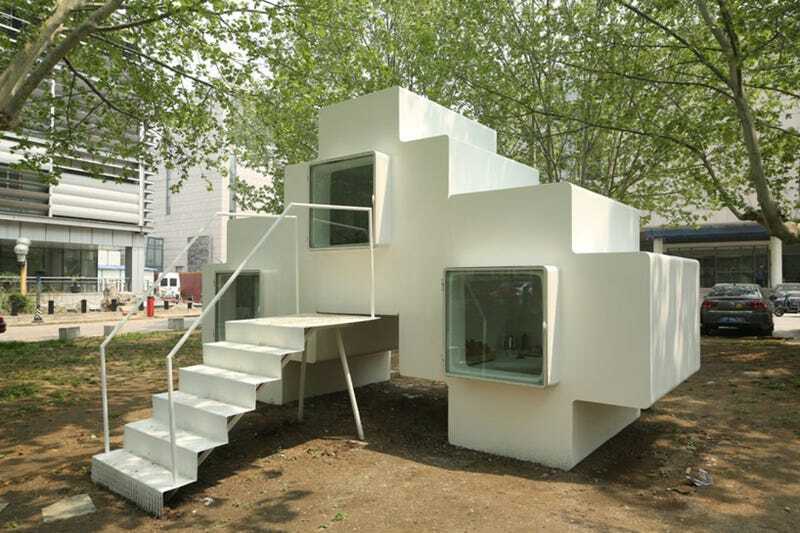 Studio Liu Lubin has just installed its prototype three-room micro house in a park in Beijing. This particular house contains an office, a bedroom, and a washroom, showing just how much can fit in such tight quarters and how much natural sunlight travels into the rooms. And the concept image of a high-density community offers a better sense of how the modules might fit together, with some rooms connecting directly to others and the modules providing stairway passages to the higher levels. It's an intriguing concept, although it appears that, unless two rooms are connected by a window, you would need to go outside to travel from room to room. Perhaps individual residences within a larger community would all exist on the same level, with apartments consisting of long corridors of connected rooms. You can see more images of the prototype and the design phase of the micro house on Designboom.